OK, Laughlin is not exactly the jewel of the Colorado River, but it is a convenient 5 or so hour drive from Southern California and it has cheap hotel rooms. For our first day of driving we wanted to make it an easy trip since we only need to average about 500 miles per week to meet our schedule. Anything much less than 5 hours would have left us in the desert surrounded by nothing but cactus and scrub brush between Barstow, CA and Needles, CA. So, Laughlin it is. We stayed at Harrah’s which is on the west end of Laughlin. The weather was very nice and we enjoyed our brief visit. From Laughlin we’ll make the relatively short trip to Williams, AZ, gateway to the Grand Canyon. Actually, Laughlin is a great place to visit. About four miles north are the sacred mountains which are home to Grape Vine Canyon, with petroglyphs which are thousands of years old…to the east across the river is the historic ghost town of Oatman, which has wild burros which wander the streets, greet the tourists and stick their heads inside of cars. It is a terrific place to revisit the past, see western shoot outs in the streets, and taste Navajo Tacos and fry bread! North of the Laughlin is Lake Mojave, an enormous desert reservoir, stretching for miles and a wonderful place to waterski. The Colorado River in Laughlin is full of jet skiiers. South of Laughlin is Lake Havasu, which is now home to the historic London Bridge, which was brought here in pieces and reconstructed. If Laughlin is a bit too quiet and tame, with ATVing in the desert, shooting at the desert rifle ranges, hiking in the desert, visiting ancient sites with petroglyphs, seeing ghost towns and burros, one can drive the historic Route 66…or go a bit north to Boulder and take a ride on one of the most extreme zip lines in the U.S., visit some of the old mines and mine for gold and ore, 4 wheel in mountainous and desert terrain, ride horses forever, visit with a giant tarantula, or head 90 miles north for a day and visit the urban center of Las Vegas. 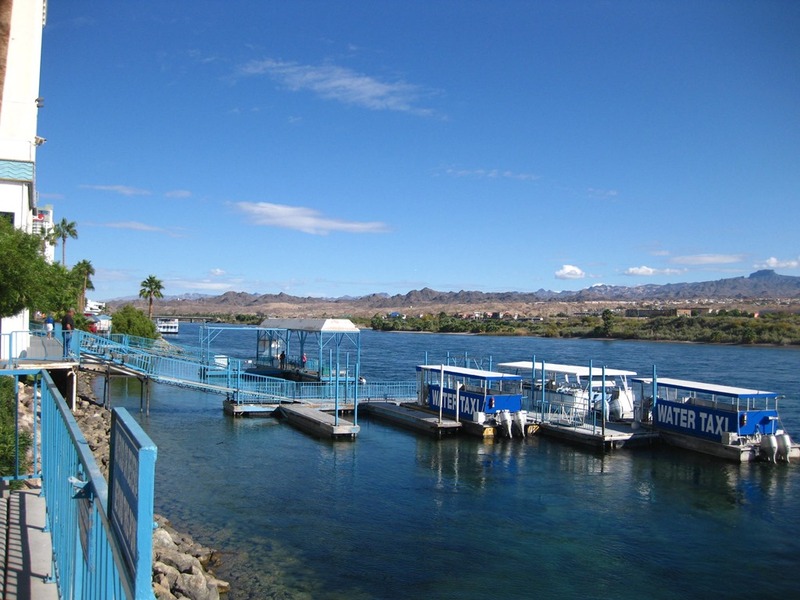 Laughlin is a hidden jewel at the three corners of Nevada, California and Arizona…loaded with dozens of things to do and places to explore, and hundreds more for those with imagination! Wow. If only I had some imagination.